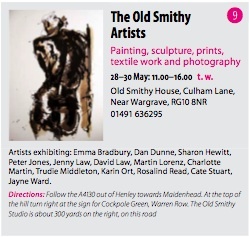 This year I am taking part in the Henley Arts Trail and exhibiting my work with ‘The Old Smithy Artists’. The Old Smithy Artists includes visual artist and painter Dan Dunne and textile designer and artist Trudie Middleton. For more info please visit the Henley Arts Trail website here.